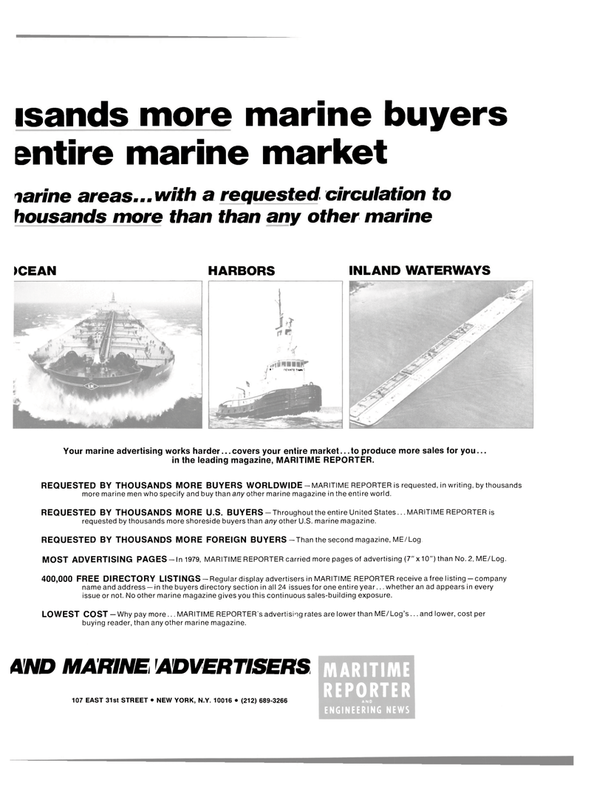 MOST ADVERTISING PAGES-In 1979, MARITIME REPORTER carried more pages of advertising (7"x10") than No. 2, ME/Log. 400,000 FREE DIRECTORY LISTINGS - Regular display advertisers in MARITIME REPORTER receive a free listing - company name and address — in the buyers directory section in all 24 issues for one entire year... whether an ad appears in every issue or not. No other marine magazine gives you this continuous sales-building exposure. LOWEST COST — Why pay more... MARITIME REPORTER'S advertising rates are lower than ME/Log's... and lower, cost per buying reader, than any other marine magazine.